Long hailed as a news outlet of the people, New York 1 recently reported about SeeClickFix and the city 311 Department's potential to incorporate the new technology. Interviewing local New Yorkers, New York 1 found that many people were enthusiastic to see the city adapt SeeClickFix to their own existing system. Personal Democracy Forum Founder Andrew Rasiej said in the news interview, governments are really playing a game of catch-up with new emerging technologies. He sees SeeClickFix as one of many new applications that allow people to have better lives where they live. The city of New York is looking into how they can incorporate SeeClickFix into their current system because as New York 1 has made clear: New Yorkers want New York to remain one of the best places to live. Tuscon, AZ has signed up for the SeeClickFix Plus App along with New Haven, CT and Manor, TX. The beautifully designed Tucson Sentinel recently ran article for its readers explaining why the city has switched from their previously awkward city service system to SeeClickFix. In the article, Andrew Greenhill, chief of staff for Mayor Bob Walkup of Tucson said, "This system will let us solve problems and save money." He added of the switch from their old reporting system to SeeClickFix, "Better quality data will allow us to fix more potholes, more quickly." Tucson has realized that SeeClickFix not only makes delegation of work orders flow more smoothly, it also frees up time and resources so that more problems can be fixed. "We'll be able to move money from running the (current) system to filling potholes," said Greenhill. And for all the hopes that SeeClickFix has had since its inception, this summation by Greenhill not only reaffirms the genesis of the company but far exceeds every goal. And with that in mind, SeeClickFix is both honored and enthusiastic about the future of Government 2.0 and its implementation in cities like Tucson. As with any start-up, small pockets of society, perhaps the more obscure groups, are the first to latch onto trends. When SeeClickFix launched in 2008, it was the niche bloggers and cyclist groups around the country who promoted and used our tools. In the past few months, SeeClickFix has drawn more mainstream media partners from all over the world and we couldn't be more happy. Media partners are connecting SeeClickFix with governments and helping to make our tools a vital part of fixing city infrastructure... and of course those darned potholes! But in the past week we've had a few interesting partners join up or continue to promote SeeClickFix and we wanted to point a few out to you. 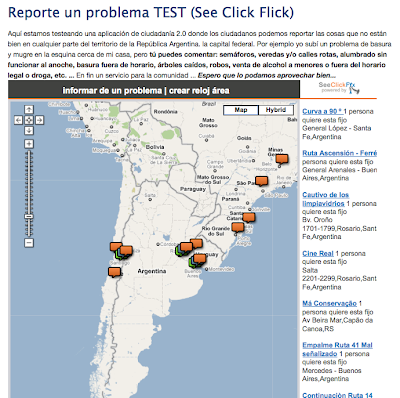 Based in Argentina, this website who has recently launched the SeeClickFix map has a fresh objective: "Building a citizenship based on the values of our Constitution, transferring the virtues of private to public." While their SeeClickFix activity is quiet at the moment, they are helping to introduce the technology to their citizens and are staying true to their ideals of turning citizens into vale-based constituents. You can visit their SeeClickFix page page here. Christian Grantham is a Nashville, TN-based multimedia journalist who works a day job as a producer at a local television station but devotes the early morning hours of his days (6am-7am) hosting his own webshow. Capitol Hill Seattle is a great blog in Seattle, WA, who focuses on neighborhood-specific issues. They've embraced SeeClickFix since its start. Read their most recent post here. This hyperlocal website is one of newest media partners! We recently added their neighborhood of Coconut Grove to the SeeClickFix map and they've kindly added a jazzed-up version of our widget to their website homepage. Run by community members for community members, Grandavenews also employs the work of students and professors from the University of Miami. Albuqerque, New Mexico, quintessentially demonstrates exactly what SeeClickfix was created for: To join the public sector, the private sector, and the media. The Albuquerque-based KRQE recently did a news feature about SeeClickFix and how it has been helping everyone in the community for over a year, but found more success as site traffic recently began to grow. The KRQE interviewd a myriad of residents who were using SeeClickFix to report everything from traffic problems to overflowing garbage bins to environmental concerns. And they also made sure to find out exactly how the local 311 was helping to field these issue requests. 311 Division Manager Esther Tenenbaum, who has been familiar with SeeClickFix since it launched in Albuquerque, said she was very happy with the way the site was working for her department and the citizens of Albuqerque. Her 311 department is planning to train at least one dozen managers to answer and respond to issues posted on SeeClickFix. As of now, Tenenbaum delegates out issue complaints to appropriate departments to handle. The citizens agree that Tenenbaum and her staff are doing their jobs as promised. In fact, one resident reported that his issue was fixed within 30 minutes of posting it. See the whole news story from KRQU below. Also this week, the Albuquerque Journal joined SeeClickFix as a media partner and residents can report issues from their website. 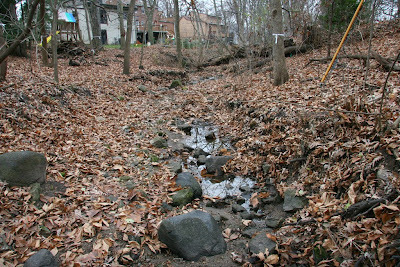 In Madison, WI, we have small streams and ravines serving as channels for stormwater. Over the years, more pavement led to more runoff, creating problems with flooding and erosion. 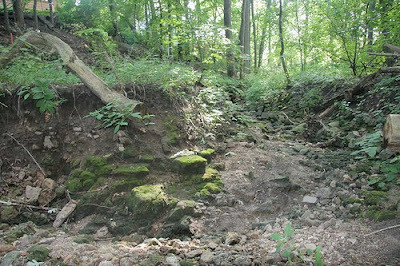 In one ravine, growing erosion was ignored by officials and neighbors until it threatened a sewage line. 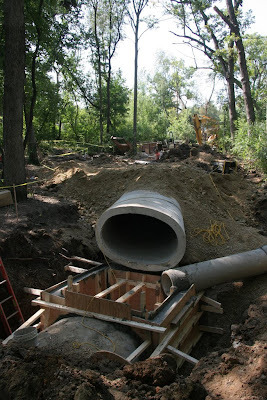 The city proposed to solve the erosion by burying the stream in a big pipe. But neighbors revolted, demanding a better plan--one that wouldn't destroy the natural beauty of the little stream. Neighbors wanted to preserve the beauty of this little stream. I became involved because a year ago, the city had buried a similar stream in my neighborhood. I had ignored discussions before the plan was set, but now I was horrified by the result. I realized there was still time to make amends by working to save the new stream. Citizens have to take more interest and responsibility for the waterways in their back yards. When I heard about SeeClickFix, I realized this was the perfect tool for correcting stormwater problems before they get out of hand. Because when storm water has its way, engineers want to step in with the "final solution." Goodbye stream. First of all, backyard streams need to be cleaned up. They can't be a place for throwing trash or yard waste. Once neighbors clean up, then do some bank repair and plantings, little streams become something worth saving. Streams are just like city streets. If you patch erosion along their banks early, it's easy to fix. If you let the problem go--it gets expensive. 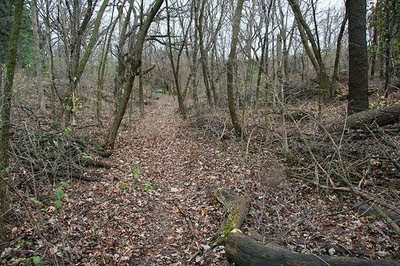 Problems in ravines are easy to ignore--out of sight, and out of mind. 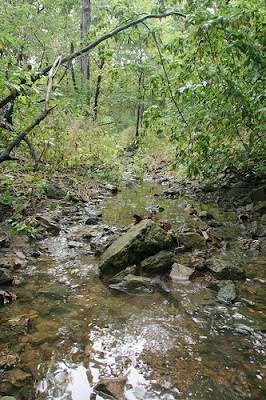 But it's fun to explore these little streams, and document problems you see with a camera. SeeClickFix can blow the whistle. 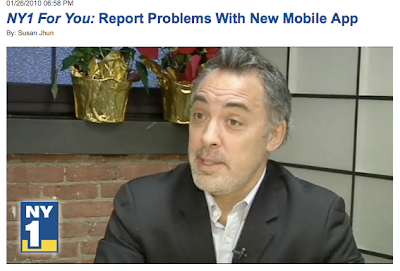 Below, I'll list some of the problems you can report with SeeClickFix. Just like city streets, bank erosion has to be patched before it gets out of hand. Yard waste and downed trees need to be cleaned up. But some dead trees and brush should be kept for wildlife. 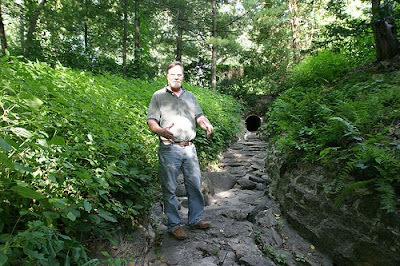 Tim Kessenich shows how he's reinforced a stream that runs through his yard. It takes minor but regular maintenance. Stagnant pools can lead to mosquitoes, if they remain for weeks. Here's what you can do. Rain gardens help by taking care of rain where it falls. By allowing rain to sink into the soil, there will be less runoff--with less damage to stream banks, and more groundwater to maintain flow during dry spells. Rain gardens are needed not only for your downspout, but also for runoff from large parking lots and for streets. Citizens can use SeeClickFix to identify good spots for larger rain gardens. Neighbors need to step forward to help maintain these gardens--and SeeClickFix can help recruit and organize volunteers. 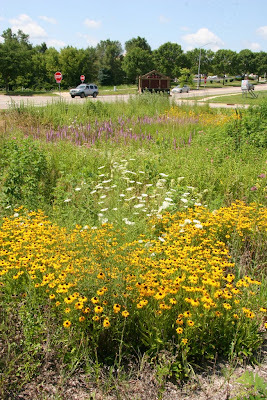 Rain gardens save tax dollars--they also beautify neighborhoods and increase property values. This rain garden handles runoff from a parking lot in Madison, WI. Find out here about rain gardens. A rain garden for your school. Philadelphia plans to become a green city. Find out here about the battle to save a stream in Madison, WI. 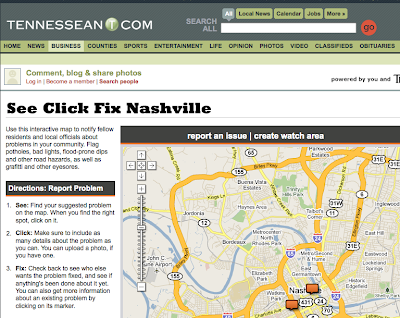 The Tennessean.com recently launched SeeClickFix as a reporting tool on their website. But plugging in code for the widget is not all they did. Recently, their Action Line Columnist, Jenny Upchurch found an issue a reader posted regarding traffic signal timing and expanded the story on their website to show readers how SeeClickFix is working. It turns out that the Public Works Department indeed had to fix a problem with the signal lights at a cluttered intersection and hopefully their efforts will help traffic to move more smoothly in the near future. Upchurch included some suggestions for fixing the signal from another reader who frequents the troubled intersection and then brought the issue and suggestions up with the Public Works Department who had a response for Upchurch. A big thank you goes out to the Tennessean for taking the SeeClickFix tools one step further and becoming part of the solution. 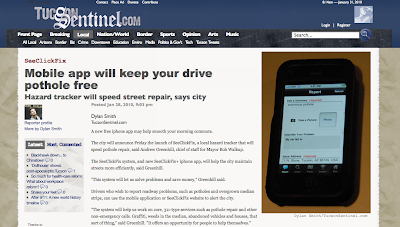 YpsiNews.com in Ypsilanti, Michigan, recently launched the SeeClickFix widget on their homepage. Hoping to have the tool work the best for their readers, YpsiNews suggested that we add some more photo thumbnails to our "Hot Issues" tab. With pleasure and little work we were able to do so, and thank the innovative people at YpsiNews for the suggestion! Check out their website and how cool it looks! 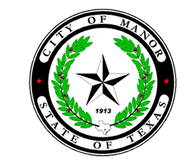 On Thursday, the city of Manor, Texas, just outside of Austin, announced that the city would be launching SeeClickFix to crowdsource their service orders. See the full announcement here. We've been accustomed to city governments embracing the tool, but never before have we had a city be so progressive with their deployment of its use. "Know worldwide for its innovative uses of technology," says the city's website, Manor, has not only promised to incorporate SeeClickFix, but has created a separate tab on their website for people to report to SeeClickFix. Much in the way UPS uses a whiteboard to mesmerize people in their commercials , Manor has created a video with a whiteboard diagram to explain to residents how SeeClickFix works (see below). The video points out that SeeClickFix doesn't bypass anyone, be it an authority figure or a resident, but rather helps to dole out responsibility more efficiently. In the future, they intend to evaluate how SeeClickFix can work for code enforcement and building inspections. Today Manor has a clean and informative website, which showcases this progressive city but you might also remember Manor from the early '90s when it was the filming set for What’s Eating Gilbert Grape. But, sorry to tell you, the water tower that the young Leonardo De Caprio (Arnie) climbed during the movie, is no longer in use, but is still there as a landmark. "We are living in tough times in our town. The city is growing very fast and the government services have a lot of problems. A service like SeeClickFix can be very useful for us to attract some attention on many annoying problems which are disturbing our quality of life." A call to arms was issued to get translators working to make SeeClickFix more useful for concerned Bulgarian citizens. Our Side Click found at least five volunteer translators and has 133 Facebook members of his own group. Goran Angelov, our Side Click, is helping to teach others how to use the tool by commenting on issues and responding to other people's comments; a great method to get SeeClickFix working in the community. If you'd like to become a Side Click, please visit our page "Get Involved" http://www.seeclickfix.com/whats_a_sideclick. From there, we can help you to utilize the tools to help others just like Goran Angelov has done in Bulgaria, where he first believed that issues might not get any response from government officials. In fact, he's helping to change his community one issue at a time and proving that a little positive communication goes a long way. Thanks to Goran Angelov and all our Side Clicks. 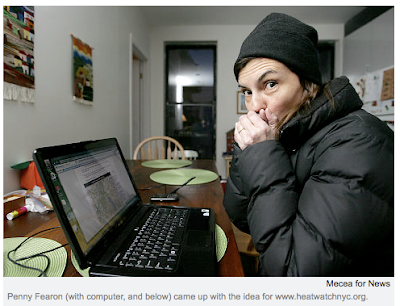 Brooklyn mom, Penny Fearon has received some recent press attention for her efforts with her recently launched website, www.heatwatchnyc.org. Fearon hopes to bring public awareness to New York City residents who are left cold inside their own apartments due to negligent landlords. In The New York Daily News article, "Brooklyn mom Penny Fearon's Web site heatwatchnyc.org turns up heat on slumlords," Fearon's quest to get some much needed heat to local residents turned into a bit of a mud slinging attempt from Mitchell Posilkin, general counsel for the Rent Stabilization Association of NYC. He said in the article that heatwatchnyc is likely to do more harm than good. The argument against Fearon's efforts is that 311 in New York is already doing a good job and posting heat related concerns on heatwatchnyc, is not getting people results. In a recent phone interview, Fearon stated that she is in no way trying to draw people away from 311. In fact, she notes that at the top of her website, people are encouraged to first go to 311 before reporting any heat complaints on her site. Fearon continued to explain that when she had a heat issue in her apartment, she called 311 and was given a written documentation of her complaint -- something she said gave her security that the issue would be fixed. The pressure is not intended for 311 through Fearon's site, but rather for the landlords to have more accountability. Fearon's website is a public forum for people to report about negligent landlords and inhumane living conditions caused by lack of heat and hot water -- something she feels all humans have the right to. Fearon summed up the passion behind her work, "People can complain all day about how cold they are and unless the landlords are looking it, nothing will be done." She is offering another way to help citizens publicly document their quality of life concerns and her website is proof that transparency is the key to getting things done. Already, her website has helped people get their heat turned back on and she's spent all her free time working with residents to make this happen. She advises users to call 311 to file a formal complaint while also reaching out to their landlords to reiterate that New York has a mandatory law that no people should be denied heat. Her efforts as a citizen working -- for free -- to help other citizens is yet another part of the Community 2.0 picture and should be applauded! Nearly 700 watchers were created on SeeClickFix this week...the majority of these watchers were government agencies. Many of them are signing up for SeeClickFix's low costs professional solutions. Why are so many cities adapting so quickly? A few years back smart municipal governments decided that customer service needed to be a priority if WeThePeople were going to be happy government consumers. We needed 911 less 600 for a lesser degree of urgency. 311 would be the solution to saving communities where 911 was the solution to saving lives. To encourage citizens previously discouraged from constructive participation to suddenly engage is a task in itself. To handle the engagement is equally challenging. Addressing this from within City Hall is not sustainable for large Gov nor scalable for small Gov. The root of 311's problem goes back to its evolution from its closest cousin 911. 911, by evolution, is locally and institutionally managed as its funding comes from state taxes on local utilities. One might argue that a federally funded centralized 311 would be the way to better handle the situation. I would argue that centralization is an old and much less efficient way to solve problems in an age of distributed communication. To reduce the cost of keeping a consumer-minded constituency happy we need to distribute the overhead of the centralized system that creates the satisfaction of a feedback loop. We also need to throw-out the idea of citizen solely as consumer and think of ourselves as distributors as well. To solve problem one (getting the participants to participate) we have taken the entry point to 311 and placed it everywhere that the consumer is. SeeClickFix exists on their different smart phone platforms, on their phone line, on their PC, on their government website, on their community group website, on their facebook page and most visibly on news sites that they read multiple times a day. As New Haven Mayor John Destefano said to me when were introducing the idea of SeeClickFix, "The Yankees don't care who you bought the ticket from to get to the game, they just care that you get to the game." Proof that it works: When the Boston Globe posted its SeeClickFix map over 800 potholes were reported in weeks around Eastern Massachusetts at zero marketing expense or energy to municipalities. Problem one solved. Enter problem two: There needed to be good way to distribute those reports to the 30 different municipalities that were accountable for fixing those potholes. The solution - Watch Areas. Watch areas are a tool that is instantly scalable to the unique geography of each responsible municipality. They can be turned on by citizens in minutes without the hesitancy of bureaucracy. All issues were documented on the Boston Globe for all to see and for places where citizens, the paper or Government had already set-up watch areas - alerts were sent. Problem two solved. Communication channels have been opened and communication has been delivered to the correct parties. Enter problem three: How could those parties provide a feedback loop for all of this new inbound communication? The answer lies in the different types of communication that were coming in. For the pothole complaints the answer might be to fill the pothole with asphalt and fix the problem. But what if there were no resources? The answer might be "you can see how many potholes that need to be fixed as well as we can. Now you the citizen understand what we're up against." We're an industrious global citizenry . We like to know the truth so we can assess and properly solve the problems. That's why we like transparency. What if the problem is graffiti, littering or a broken park bench and tax dollars have dried up? For that situation we provide a tool that not only allows distribution of communication to the traditional "fixing" channels, but to the rest of the community as a whole (anyone can create a watch area). When you open up the fixing channels to community groups, parks groups, private business and individual citizens, you distribute the responsibility as well as the communication. Problem 3 Solved. Over the past two years these are the philosophies that have driven the functionality and development of SeeClickFix as it aspires to be universal and distributed 311. We have a lot more to do and you have a lot more to tell us in order to make it better. As more governments join the media, community groups and citizens on SeeClickFix, our solutions will become more tailored to their needs as well. Some governments are set-up to distribute services better than others but none to their full potential. All Government could use more help from their citizens and it seems that many are now willing to ask for it. Distributed Governance and as such Distributed 311 is not what gov can do for its citizens, but what its citizens can do for themselves. As an addition to this post I wanted to add a video that one of our new clients, Manor Texas, put together on how SeeClickFix works. Dustin from Manor explains the distribution internally that makes SeeClickFix more efficient for Gov accountability and response. The Seattle Post Globe has an article today detailing how citizens in Seattle can now use SeeClickFix on the Capitol Hill Seattle Blog to report issues in their neighborhood. The article notes that watch areas have been set up for the Seattle Department of Transportation and the head of the City Councils’s Transportation Committee, Tom Rasmussen. They are encouraging readers to use SeeClickFix to report issues because the tool provides a way for citizens to create a community around the issues. When neighbors get involved in helping to find and resolve issues in coordination with government, rather than simply anonymously sending reports through the City’s 684-ROAD complaint line, they can build deeper relationships with one another. We look forward to working with the team at Capitol Hill Seattle blog in helping citizens help themselves. As we celebrate the 75th Birthday of one of Nashville, Tennessee's greatest legends, Elvis Presley, it's also fitting to tip our hats the Tennessean.com -- another great Gannett website. We'd like to thanks Ted and Knight of Gannett for everything they've done, especially the tutorial videos on how to use the SeeClickFix tools, which is on our How it Works page. "We are living in tough times in our town. The city is growing very fast and the government services have a lot of problems. A service like SeeClickFix can be very useful for us to attract some attention on many annoying problems which are disturbing our quality of life. I know that your services are not going to work for Bulgaria but we are group of people who are ready to send official paper complains and reports about the problems to the authorities." Did you catch that? First of all, we believe that SeeClickFix can and does work in Bulgaria. And if you want to help translate the site into Bulgarian, please let us know. The software supports Bulgarian. Second of all, he is prepared to send paper-based reports to the government. That's dedication to civic engagement. With all our focus on smart phones, website and phone calls, it's great to see that whenever citizens are motivated there can be civic engagement. So, all the rest of you have no excuse not to whip out your smart phone and See, Click, Fix. Let's do it! Sometimes it's nice to remember where everything started. We're talking about potholes -- one of the more popular and most burdensome, non-emergency issues reported on SeeClickFix. News 9 in Oklahoma recently reminded their viewers that snow removal and winter conditions can cause cracks and potholes on the road surface. News anchor Mindy Mizell explained that SeeClickFix is the perfect avenue for reporting issues like potholes as the weather breaks and the roads are cleared. Taking heed of environmental conditions after deluges or rain, fierce snow storms, or extreme droughts, is a great idea. See the News 9 video here. As many of you know, the New York Times did a great write-up about SeeClickFix. The story ran in the business section on Monday, January 4 and made the most emailed list that day! You can read the story here. But unlike some news stories that have focused on our tools or the creation of the technology or the importance for bridging gaps between community members and government agencies, "News Sites Dabble With a Web Tool for Nudging Local Officials," by Daniel E. Slotnik, looks at how SeeClickFix is influencing news websites and the future of media in general. 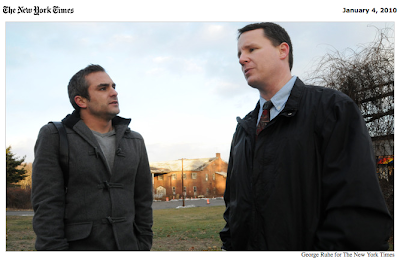 Doug Hardy, Associate Editor at the Journal Inquirer, who has held a Pro Account with SeeClickFix, said, in the article, “The writing is on the wall.” Mr. Hardy continued, “If we can’t remain competitive, you know, we’re not going to be around." And not only does Mr. Hardy understand how useful SeeClickFix can be for helping editors and journalist source stories, he also knows that it's a great tool to help his newspaper and the industry as a whole, move forward with technology and not against. One way to add a brand to the live conversations happening right now in cities across the country on SeeClickFix, is to sign up for a Pro Account. Users can do so by emailing team@seeclickfix.com or checking out the details page here. A Pro Account, as it's done for Mr. hardy, allows users to add an image to their profile, which in most cases is a brand if you are a business or personal photo if you are, say, a public official. Joining conversations like Mr. Hardy has is one way that SeeClickFix offers new perspective for media outlets. See, click, fix. If that sounds like an agenda for media entrepreneurship, well ... it is. SeeClickFix, a local advocacy web site, won seed funding at last year’s We Media Miami conference. On Sunday it was featured in a New York Times story as a strategy for mobilizing citizens, publishers and local government into action on hyperlocal issues impacting communities. Ben Berkowitz, the founder and CEO of SeeClickFix, will be back at this year’s We Media Conference on March 9-11 in Miami to report on local interactions and collaborations shaping digital society. So will a group of the keenest thinkers, sharpest minds and shrewdest entrepreneurs seeking $50k in the We Media Pitch It! Challenge. You can enter the challenge here. Or register for this year’s conference, which showcases Game Changers: People, projects, ideas and organizations leading change and inspiring a better world through media. We Media is the conference about people before they are famous and ideas before they are safe. It has launched and inspired dozens of businesses, products and movements shaping news, information and communications in the digital age. It is a showcase of innovation and invention, a venture-funding venue, an innovation meet-up, a social networking experience and a game-changing gathering of the brightest minds and ideas in digital media. It mixes practical business realities with cutting-edge solutions from commercial and social entrepreneurs. If you’re trying to change the game through digital media - hey, who isn’t? - you gotta be there. You’ll hear from change agents like Newser’s Michael Wolff, Ashoka's Diana Wells, social culture thinker Stowe Boyd and Be the Media’s David Mathison; you’ll learn from Mashery founder Oren Michels how API strategies tap into partner creativity and expand revenue options. You’ll discover how companies like Demand Media are advancing computational news and information; discuss the future of news in an atomized, connected market with Associated Press CEO Tom Curley and Knight Foundation CEO Alberto Ibarguen; and consider, with insight from Xerox’s innovation guru, Francois Ragnet, how the explosion of personal and business media fits with ambitious goals for sustainability and energy efficiency. You’ll see the new screens delivering 3D content on new devices; be part of the BBC global broadcast of World Have Your Say; and participate in invention sessions organized around the forms, formats and frameworks of digital media. That’s just for starters. You can show off your projects, pitch funders, discover new business models, deploy instruments of social impact and change, and be among the first to discover the information technologies, social-media breakthroughs and cultural imperatives emerging in 2010. Think the previous decade was disruptive? Almost nothing has been invented yet. This year’s We Media conference launches the decade of the individual entrepreneur. Join us. You need to be a part of it. The price goes up after January 15, so register now to save some money. To register now, click here. Let’s put that another way: Register today because creativity is served by first movers. Participation at We Media is limited to the 300 people who move first. Chicago-based CBS2 News tracked down a common SeeClickFix story: Pothole riddled street -vs.- Local resident. 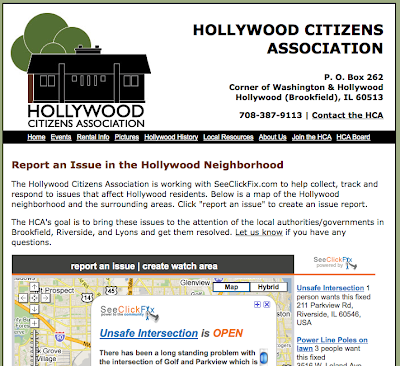 The local resident in this case, who resides in Evanston, IL, used SeeClickFix to report her issue. In this CBS2 News story, Eric Palmer, Evanston Communications Coordinator, responded that SeeClickFix could very well become a vital tool to help residents report issues while also offering another way for govenment to repsond to the issues. SeeClickFix, he says, is part of their bigger GOV 2.0 picture. "This is one of the fastest-growing forms of communication that people are using nowadays," said Palmer. The city of Evanston says they welcome new forms of communication because they know it helps them to do their jobs to the best of their abilities. Hi there, SeeClickFix folks. My name is Colleen Curry, and I run Freehold.InJersey.com, a hyperlocal news website in New Jersey and one of Gannett's first hyperlocal sites in the country. We've been using SeeClickFix on our site for a few months now, and it has helped engage our readers, generate stories, and impel action in our local community. Ben asked me to share a few of these highlights with you. - SeeClickFix became a major player for us when a near-fatal car accident at a troublesome intersection sparked a discussion about road safety improvements. The raucous discussion then moved over to our SeeClickFix map, where users highlighted the intersection's danger and questioned the local government's inaction. This generated two follow-up stories for us where we helped bridge the discussion between our blog, the SeeClickFix map, and the local government officials. We identified the actual danger of the intersection--in numbers--and relayed explanations and timetables from the governments to the people. Soon after our posts, the print paper picked up the story and ran a longer piece about the intersection's history. In response, the county and town governments decided to hold an open meeting to present plans for improvements to the public. We were able to Close the ticket on the map because the government had acknowledged and begun to solve the local problem. In all, the intersection generated about 6 stories for us, largely based on readers directing our attention to what mattered to them. - Also this fall, I did a series of in-depth multimedia stories about a local lake that was pretty well ignored by the community-- I thought no one knew/cared about it. Within a couple of days of posting the first story, there were multiple entries and votes on the Map about cleaning and dredging the lake. I had no idea people in the community cared about environmental issues like this one, and they didn't comment on my stories to tell me- they used the map. We haven't had direct public action yet, but the issue is certainly being discussed. - My favorite issue reported on the Map so far has been "Bad Reporting," which was located at our own Press building. The person who raised the issue said we didn't offer enough coverage of local events, and a second person replied that we--the press--couldn't possibly cover everything, hence the need for citizen journalism. It was a conversation I never expected to see on a See Click Fix Map, but it was awesome. - Most recently, I noticed we had a few complaints about a lack of sidewalks on a major highway with bus stops all along the route. I went out and took some pictures of the situation, posted them, and asked readers if they agreed with the complaints and wanted me to do some investigative work about it. They did, and I ended up writing two or three stories about the Department of Transportation's response to the situation. Soon after, two pedestrians were killed along the same route at the bus stops; the articles, discussion, and comments to the map will continue to track this story as a matter of public record. - Finally, our police chief has recently started reading the map and encouraging our readers to post any kinds of crime tips directly to it. We have a meeting set up so I can help him understand how to use the open tickets and respond directly to readers. This way, we can be a direct intermediary from the public to the government, and vice versa. The map has been an awesome tool for communication on our site. Thanks to Ben & the SCF team for all the hard work! 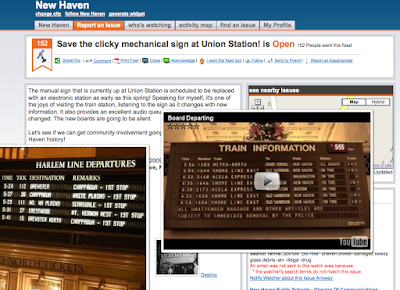 152 Different people have commented on saving the last Solari Board on the North East Amtrak line. Most are for preservation. Some are for negotiation with the State on a compromise. Some are for tasteful recreation of the sign. Either way its exciting to see residents so passionate about a piece of civic infrastructure. Caring about the place where you live in is what SeeClickFix is all about. As Sid Burgess said to me the other day, "I just want people to be happy with where they live"
Here's the NPR story: http://www.npr.org/templates/story/story.php?storyId=122190224&sc=emaf - No hard feelings on the Credit NPR. We still love you.